One Hive is business multipurpose WordPress theme designed for running business organization, startup business, corporate business firms, portfolio showcase agency, freelancer portfolio or can be used to create any kind of multipurpose WordPress website. Below is the full documentation for One Hive WordPress Business Multipurpose Theme Documentation. Click on the screen shot if the text written at the screen shot is not readable. First of all, Thank you so much for purchasing this theme and for being our loyal customer. You are awesome! You are entitled to get free lifetime updates to this product + exceptional support from the us directly. You can install theme from WordPress admin dashboard. This will be the first process of installing theme in your WordPress website. Select the theme from your computer & hit install. After you install Activate theme. Navigate to wp-content folder and then to themes folder. 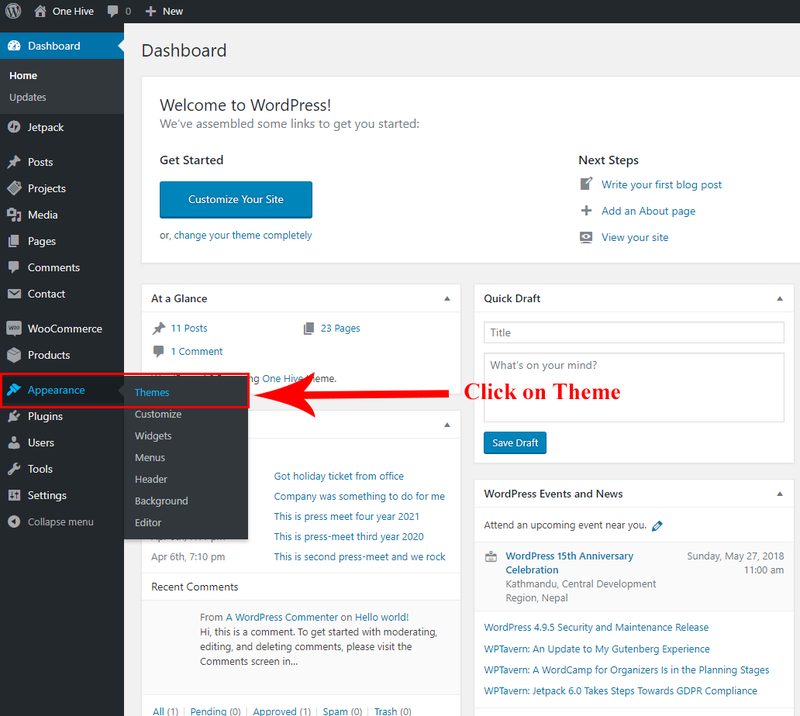 Log-in to wordpress dashboard & now activate the theme. Install plugin called “THEMEBEEZ : TOOLKIT” which is shown in recommended section. Install the plugins which are recommended from there and activate it. Now, you can see different demos and click on import which you like. When demo import is done, now its time to setup widgets, banner, menu and few other settings according to your requirements. It’s easy to import demo in pro version. Follow the steps below to import demo data in pro version. Now you will see 5 demos data ready to import. Check all five previews of demos. By default WordPress sets all theme to blog page ( NOT HOME PAGE ). You have to manually set your homepage. To set your homepage you navigate to Dashboard > Appearance > Customizer > Site Option > Check the Front page option. If you think your Frontpage/ Homepage didn’t got activated let us know. One Hive is crafted with handy important customization options powered by wordpress live customizer. You can find all options under Dashboard > Customizer. Font Option ( PRO ) : You can switch between 800 ++ Google fonts according to your requirements. Colors ( PRO ) : You can switch any primary color that best match your brand or need. Hide/Show : Some content information like date,category,date,author etc can be enabled or disabled through Dashboard > Appearance > Customizer > Content options. Excerpt length : You can change the length of excerpt from Dashboard > Appearance > Customizer > Theme options > Others. Fall back Default image ( PRO ) : You can enable support of fall back image if there is no image in post from Dashboard > Appearance > Customizer > Theme options > Others. One or Multi site : One Hive can be used either Multi page or one page. You can tweak this from Dashboard > Appearance > Customizer > Site option. When One page is enabled, you can enter id for the sections and set custom link in primary navigation items like eg: ( Enter ID for blog section “blog” now go to menu & add custom link with link #blog and name it Blog. Then save ). Try it yourself. If you do not understood let us know on support. Section re-order ( PRO ) : One Hive is crafted with section drag & drop option. You can drag and drop and change the location of sections up and down according to your need. 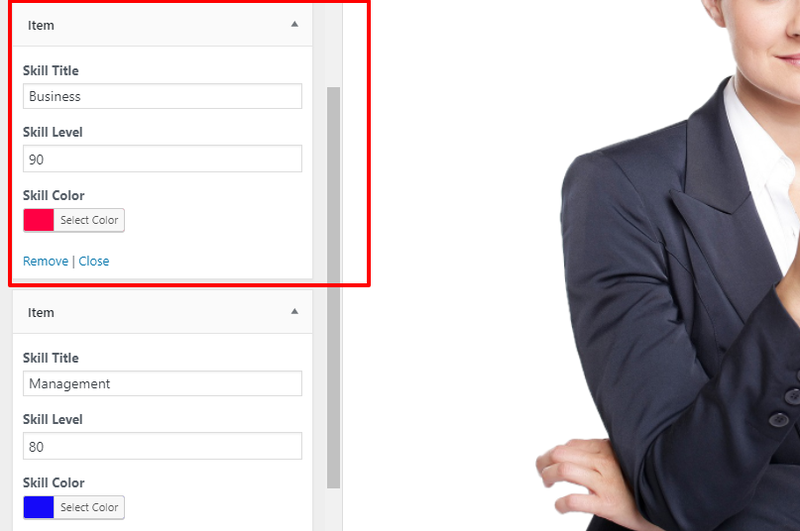 To re-order sections navigate to Dashboard > Appearance > Customizer > Home page option > Section re-order. Sidebars : We understand that some peoples may not like sidebars. To make your need hassle free we have added sidebar options you can have sidebar either in left, right or completely disable it. Dashboard > Appearance > Customizer > Theme options > Others. More : More basic options are available! You can basically tweak header section with colors and icons as per your need. You can do that in few clicks though WordPress Customizer. Options for Header section are placed inside WordPress customizer which are sticky header, header background color, header top icons and contact details , Header Gradient color, Changing logo. Header background color : Change header background color either gradient or solid colors. Custom logo : Make sure height of logo is 60px. As header portion of One Hive is small so One Hive theme looks best with logo of 60px height. Your width of logo could be anything like 200px, 300px, 250px or something like that. Header top & header top social icons : You can assign social icons at header top from when you enable header top section. Header top contact details : You can show or hide contact contact details in header top when you enable header top section option. One Hive Header top section can be enabled from customizer. Navigate to WordPress Dashboard > Appearance > Customizer > Theme options > Header > Check header top option. For Contact details options are inside Theme options > Contact info & Social icons also can be found just under the contact info options. Logo can be changed from Site identity option inside wordpress customizer. If you are adding a custom logo make sure height of your logo is 60px. 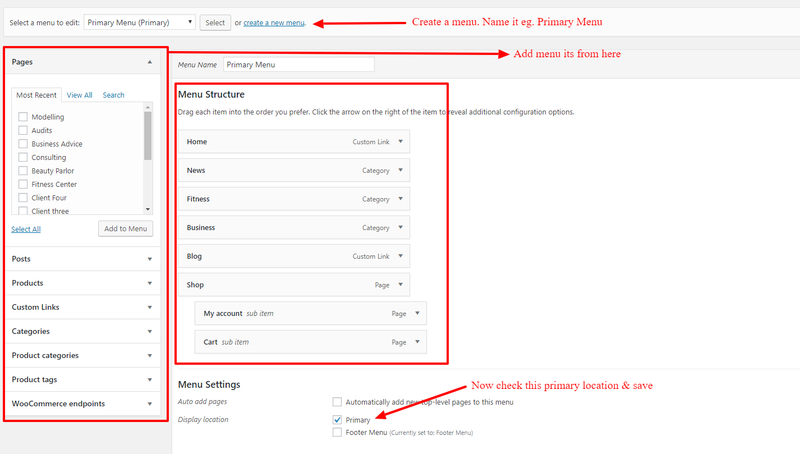 Primary Navigation can be added from wordpress dashboard > Appearance > Menu. One Hive is build with adequate sections to make your life easy & you can easily use them as per your need. WordPress Dashboard > Appearance > Customizer > Homepage Options. Sections can be enabled – disabled as per your need. Sections can be drag and dropped. You can set either background color or background image for the sections. Some sections are different in nature when talking about the design. Placing background image may not look good on that case. One Hive Pro comes with 4 types of banner options Where as free version only has only 2 banner options. Image background – Create a page & set image as feature image & publish. Select the page that you have created from banner options at customizer. Page title will appear as banner title, page editor content as banner description & featured image as banner image. Video background ( PRO ) – Upload video to media & select video from customizer > banner options > Video background. Animated partials background ( PRO ) – Go to customizer > banner options > Animated background. Gradient background ( PRO ) – Go to customizer > banner options > Gradient background. You can select colors but if you are not getting the color that you are looking for do kindly connect with us at forum, we will share you a custom css ( style code ) which you paste in your WordPress customizer custom css area. You can choose between Image background, Video background, Gradient background, Animated partials background. Free version has limited choice. You can customize author section from WordPress Dashboard > Appearance > Customizer > Homepage Options > Author. Create a page with name of author or company. Navigate to WordPress Dashboard > Appearance > Customizer > Homepage Options > Author section. Select the page that you created for Author. Theme will use Name, Short description & featured image from that page for this section. Basically the author section is designed for long vertical image. For the best result the size of the author image should be 800px width & 1350px height. You can enter your social network profile to enable social icons. For skills bars add items and enter value as shown below in screen shot. You can customize this section from WordPress Dashboard > Appearance > Customizer > Homepage Options > Features section. 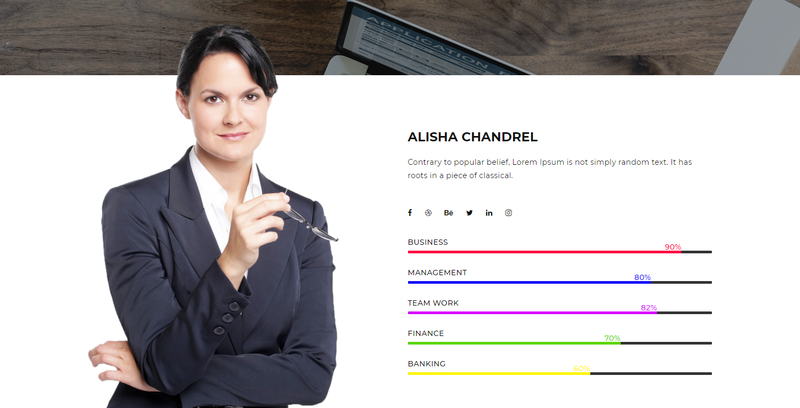 Choose between background colors, enter section title & description and add features items. Basically features items are pages with title & little descriptions. Recommended length of item description is around 3 lines. You can customize this section from WordPress Dashboard > Appearance > Customizer > Homepage Options > Counter section. Choose between background image & background color. We personally recommend nice background image for this section. Add counter items, enter number & choose awesome icon as per your counter item. You can customize this section from WordPress Dashboard > Appearance > Customizer > Homepage Options > Team section. Information of team members like Name, featured image, designation can be filled while creating a page from dashboard & then add team items from customizer. You can enter social icons for team members from when adding team member item. Check below the screenshot below. Image size of team section team members featured image is 200px width & 200px height. Image you select will be cropped but maintain aspect ratio when uploading. Service section is alternative to features section. You can add featured images as background overlay in your items to make it more appealing. To customize navigate to WordPress Dashboard > Appearance > Customizer > Homepage Options > service section. Rest everything is same as features section. Navigate to Dashboard > Projects. To customize this section navigate to customizer > Home page options > Pricing Section. Enter the value for pricing card table as shown in screen shot below. Important : Price features must be written serpented with coma & Max number of pricing card is 3. Add posts in your posts from Dashboard > Posts & assign them a category. Navigate to customizer > Home page options > News Section and choose the category. Important : Featured image is required as it is in carousel slider. Add posts in your posts from Dashboard > Posts & assign them a category. Navigate to customizer > Home page options > Blog Section and choose the category. To add testimonial follow the instructions below. Navigate to Customizer > Home page options > Testimonial section. Navigate to customizer > Home page options > CTA section. 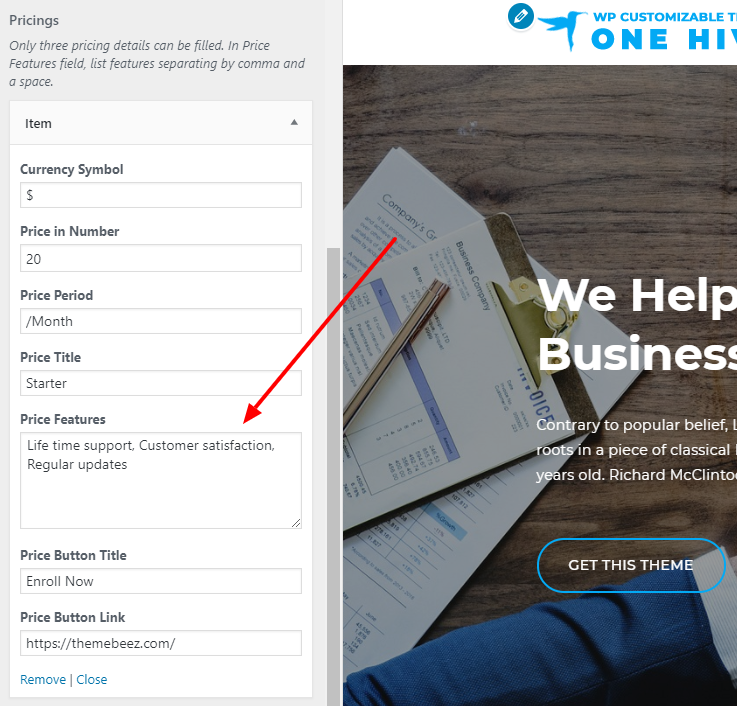 Select the page you have recently created for call to action page & enter the button link, title and hit publish. To add items in this section navigate to Customizer > Home page Option > Partner section. Contact Form : To add an contact form follow the step below. Map : To enable map You can copy iframe code from Google map and paste the code in map widget from Dashboard > Appearence > Widget > Map widget. Define height and width. Recommended sizes are 600px Width & 400px Width. You can adjust this according to height of your contact form. One Hive Contact form : Install contact form 7 plug-in and create a form. Copy the short code & paste in this widget. Then save. To change the footer copyright information navigate to customizer > Theme options > Footer. One Hive both free & pro version supports WooCommerce. Important : One Hive supports woocommerce and all basic woocommerce functionality but One Hive theme may not be good ideal solution for large e-commerce store or something like that. One Hive Woocommerce pages design may not look good if you try to extend woocommerce pages with woocommerce 3rd party extensions and plugins. We don’t guarantee you for all woocommerce 3rd party extensions and plug-ins to work perfectly as expected. All basic woocommerce functionality should work fine & we are here for support if you face any issue in future. One can start a medium scale store with one hive theme using woocommerce plugin. You are in right hand. Feel free to contact us though LIVE chat or support forum for any questions and support. We are here to help :). We have a very reasonable cost per hour charge to customize theme according to your need. You can either contact us though email or Look for Live Chat option.